Tenzin Gyatso (Tibetan: བསྟན་འཛིན་རྒྱ་མཚོ་ Wylie: Bstan ‘dzin Rgya mtsho) (b. July 6 1935) is the fourteenth and current Dalai Lama. The fifth of nine children of a farming family in the Tibetan province of Amdo, he was proclaimed the tulku (reincarnation) of the thirteenth Dalai Lama at the age of three. On November 17 1950, at the age of fifteen, he was enthroned as Tibet’s Head of State and most important political ruler, while Tibet faced occupation by the forces of the People’s Republic of China. Lhamo Thondup was recognised as the reincarnation of the Dalai Lama and renamed Jetsun Jamphel Ngawang Lobsang Yeshe Tenzin Gyatso («Holy Lord, Gentle Glory, Compassionate, Defender of the Faith, Ocean of Wisdom»). Tibetan Buddhists normally refer to him as Yeshe Norbu, the «Wish-fulfilling Gem», or just Kundun, «the Presence». In the West he is often called «His Holiness the Dalai Lama», which is the style that the Dalai Lama himself uses on his website. As well as being the most influential spiritual leader of Tibetan Buddhism, the Dalai Lama traditionally claims to be Tibet’s Head of State and most important political ruler. At the age of fifteen, faced with possible conflict with the Chinese, Tenzin Gyatso was on November 17 1950, enthroned as the temporal leader of Tibet; however, he was only able to govern for a brief time. In October of that year, a People’s Republic of China army entered territory controlled by the Tibetan administration, easily breaking through the Tibetan defenders. The People’s Liberation Army stopped short of the old border between Tibet and Xikang and demanded negotiations. The Dalai Lama sent a delegation to Beijing, and, although he has rejected the subsequent Seventeen Point Agreement for the Peaceful Liberation of Tibet, he did in fact work with the Chinese government until 1959. The Dalai Lama fled to Dharamsala, India, on March 17 of that year, entering India on March 31 during the Tibetan uprising. In 1989, Tenzin Gyatso was awarded the Nobel Peace Prize, the chairman of the Nobel committee saying that this was «in part a tribute to the memory of Mahatma Gandhi». The Dalai Lama met with the Prime Minister of India, Jawaharlal Nehru, to urge India to pressure China into giving Tibet an autonomous government when relations with China were not proving successful. Nehru did not want to increase tensions between China and India, so he encouraged the Dalai Lama to work on the Seventeen Point Agreement Tibet had with China. Eventually in 1959, the Dalai Lama fled Tibet and set up the government of Tibet in Exile in Dharamsala, India, which is often referred to as «Little Lhasa». At the Congressional Human Rights Caucus in 1987 in Washington, D.C., he proposed a Five-Point Peace Plan regarding the future status of Tibet. The plan called for Tibet to become a «zone of peace» and for the end of movement by ethnic Chinese into Tibet. It also called for respect for fundamental human rights and democratic freedoms and the end of China’s use of Tibet for nuclear weapons production and disposal. Finally, it urged «earnest negotiations» on the future of Tibet. He proposed a similar plan at Strasbourg, France, on 15 June 1988. He expanded on the Five-Point Peace Plan and proposed the creation of a self-governing democratic Tibet, «in association with the People’s Republic of China». This plan was rejected by the Tibetan Government-in-Exile in 1991. On July 5 2005, the Dalai Lama called on the G8 leaders meeting the next day to ease the plight of the millions starving throughout the world, during a meeting with the rock singer Annie Lennox. He said the meeting had «positive potential». The Dalai Lama celebrated his seventieth birthday on Wednesday, July 6, 2005. About 10,000 Tibetan refugees, monks and foreign tourists gathered outside his home. Patriarch Alexius II of the Russian Orthodox Church said, «I confess that the Russian Orthodox Church highly appreciates the good relations it has with the followers of Buddhism and hopes for their further development» . President Chen Shui-bian of Taiwan attended an evening celebrating the Dalai Lama’s birthday that was entitled «Traveling with Love and Wisdom for 70 Years» at the Chiang Kai-shek Memorial Hall in Taipei. The President invited him to return to Taiwan for a third trip in 2005. His previous trips were in 2001, and 1997. The Dalai Lama wishes to return to Tibet only if the People’s Republic of China sets no preconditions for the return, which they have refused to do . On July 5 2005, China refused his request to return to Tibet on his birthday, despite worries that if he dies in exile it may spark an uprising against the local government in Tibet and neighboring areas. Since 1967, the Dalai Lama has initiated a series of tours in forty-six nations. He met with Pope Paul VI at the Vatican in 1973. He expressed his desire to meet with the Vatican head of state Pope John Paul II. The Pope agreed and met him in 1980 and also later in 1982, 1986, 1988, 1990 and 2003. He has also met the Archbishop of Canterbury, Dr. Robert Runcie, and with other leaders of the Anglican Church in London. Finally, he has met Jewish and senior Catholic officials. He currently has ongoing relations with the Russian Orthodox Church. Lithuanian President Vytautas Landsbergis invited him to address the Lithuanian Parliament. He was the first foreign leader to do so. He currently has ongoing relations with India and has had relations in the past with the United Nations and the United States. In an unusual event, the Dalai Lama was refused a visit to South Korea in 2001. Chinese envoys and the Dalai Lama’s have had four talks since September 2002 over the Tibet Question, which has been met by international support. The present Dalai Lama is held in almost universal high regard among Tibetan Buddhists. It should be noted, however, that his views regarding controversial social issues and other matters are not necessarily shared by all Tibetan Buddhist lamas, and do not represent a binding dogma on all Tibetan Buddhist practitioners. Having little choice but to work with the 1951 Seventeen Point Agreement for the Peaceful Liberation of Tibet with China, the Dalai Lama is believed to have supported the creation of the Tibetan resistance movement. His brothers moved to Kalimpong in India and, with the help of the Indian and American governments, organised propaganda against China and the smuggling of weapons into Tibet. Armed struggles broke out in Amdo and Kham in 1956 and later spread to Central Tibet. However, the movement was a failure and forced to retreat to Nepal and/or go underground. Following normalisation of relations between the United States and China, American support was cut off in the early 1970s. The Dalai Lama then began to change his policy towards a peaceful solution in which he would be reinstated in a democratic autonomous Tibet. The Dalai Lama is opposed to usage and stockpiling of weapons of mass destruction and supports demilitarization. In 1998, he pledged his support to the People’s Republic of China’s proposal to ban all weapons of mass destruction. 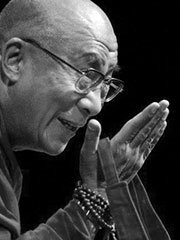 The Dalai Lama opposes wars; however, perhaps due to sensitivity to the US, he did not oppose the War in Iraq, saying that it was too soon to tell whether the end result for good was worth the harm it would cause. Similarly, he does not oppose the use of force for good. He accepts that certain wars were for the benefit of civilization & democracy: WWII, Korean War, Afghanistan. He does however espouse that non-violence in the long-term is more effective. He blames the world’s powers for wars and believes that they are simply an old habit. The Dalai Lama endorsed the founding of the Dalai Lama Foundation in order to promote peace and ethics worldwide. He has also stated his belief that modern science takes precedence over ancient religions. The Dalai Lama has received considerable criticism from the People’s Republic of China, which views his activities as subversive and dangerous. The PRC also attempts to keep the Dalai Lama from gaining entry into nations with which it has foreign relations. An example of this was in November 1999, when the Dalai Lama was granted access to visit Israel by the Israeli government, which the PRC immediately criticised. The PRC also claimed in 2001 that the Dalai Lama was supporting Taiwanese independence during his visit to Taiwan in 2001. The Dalai Lama characterised the visit as a spiritual mission. The Dalai Lama has also received criticism for his interest as a child in war toys and as an adult with his interests in World War II monuments. In October 1998, The Dalai Lama’s administration acknowledged that it received $1.7 million a year in the 1960’s from the Central Intelligence Agency (CIA), and also trained a resistance movement in Colorado (USA). Originally, there was criticism that feudal theocratic Tibet was not as benevolent as the Dalai Lama had portrayed. In response, he has since condemned some of ancient Tibet’s feudal practices and has added that he had been willing to institute reforms before the Chinese invaded. British journalist Christopher Hitchens wrote a of the Dalai Lama in 1998, which questioned his alleged support for India’s nuclear weapons testing, the «selling of indulgences» to Hollywood celebrities like Richard Gere and Steven Seagal, and his statements condoning prostitution. He accepted a large donation from Shoko Asahara, leader of the Aum Shinrikyo cult in Japan, who was responsible for the release of sarin nerve gas on a Tokyo subway, though this occurred long before Asahara instigated the attack. Though the Dalai Lama asked the White House to «think seriously whether a violent action is the right thing to do» prior to the invasion of Iraq, he has since expressed a longer term view on whether the Iraq war is justified, refusing to condemn it. He has reiterated this position a number of times since the original New York Times report. This is a stand which pacifists and anti-war protesters have found fault with. The Dalai Lama is sometimes criticized for modifying his message to be as palatable as possible to his audience, sometimes changing viewpoints according to the situation. He is also sometimes reproached for taking one side of an issue at one time and changing it later on, usually in response to criticism. This however could be seen in context with Buddhist teachings, where a teaching may benefit one person, while not the other. Tenzin Gyatso has on occasion been denounced by the Chinese government as a supporter of Tibetan independence. Over time, he has developed a public position stating that he is not in favour of Tibetan independence and would not object to a status in which Tibet has internal autonomy while the PRC manages some aspects of Tibet’s defense and foreign affairs. In his ‘Middle Way Approach, he laid down that the Chinese government can take care of foreign affairs and defense, and that Tibet should be managed by an elected body. There have been intermittent and quiet negotiations between the Tibetan government in exile and the government of the People’s Republic of China. These days, the Dalai Lama wishes to discuss the issue of the status of Tibet within China, while the Chinese government has insisted that negotiations be limited to the conditions of the Dalai Lama’s return to Tibet. On April 18 2005, TIME Magazine placed Tenzin Gyatso on its list of the world’s 100 most influential people. Honorary Doctorate of Humane Letters from Rutgers University on September 25, 2005. Honorary Doctorate of Humane Letters from Nova Southeastern University on September 18, 2004. Special Honorary Degree from Simon Fraser University on April 20, 2004. Honorary Doctor of Law Degree from the University of British Columbia on April 19, 2004. Jaime Brunet Prize for Human Rights on October 9, 2003.
International League for Human Rights Award on September 19, 2003. Life Achievement Award from Hadassah Women’s Zionist Organization on November 24, 1999. An honorary degree from Emory University on May 11, 1998. An honorary Doctorate of Philosophy from Yat-sen University on March 23, 1997. Roosevelt Four Freedoms Award from the Franklin and Eleanor Roosevelt Institute on June 4, 1994. World Security Annual Peace Award from the New York Lawyer’s Alliance on April 27, 1994. An honorary Doctorate of Laws degree from Melbourne University on May 5, 1992. Peace and Unity Awards from the National Peace conference on August 23, 1991. Advancing Human Liberty from the Freedom House on April 17, 1991. A Doctor of Divinity award from the Central Institute of High Tibetan Studies on January 4, 1990. Le Prix De La Memoire from the Foundation Danielle Mitterrand, France on December 4, 1989. Raoul Wallenberg Human Rights Awards from the Congressional Rights Caucus Human Rights on July 21, 1989. Key to Los Angeles from Mayor Tom Bradley in September 1979. Key to San Francisco from Mayor Feinstein on September 27, 1979. In 1989 Tenzin Gyatso was awarded the Nobel Peace Prize, with the chairman of the Nobel committee saying that this was «in part a tribute to the memory of Mahatma Gandhi.» He was officially awarded it because the committee wished to recognise his efforts in the struggle of the liberation of Tibet and the efforts for a peaceful resolution instead of using violence. . He criticised China in his acceptance speech for the use of force against the student protesters during the Tiananmen Square protests of 1989. He stated however that their effort was not in vain. His speech focused on the importance of the continued use of non-violence and his desire to maintain a dialogue with China to try to resolve the situation. Among the films that have been recently made about the 14th Dalai Lama are Kundun and Seven Years in Tibet.